The Roy Orbison Museum in Wink, Texas, his boyhood home. If you are old enough, you've heard Wink mentioned for being Roy Orbison's boyhood home. If you're like most people, while you were on the way to get an atlas you probably got distracted, so you're still unaware of exactly where Wink is. If you're young enough, you'll probably ask Roy who? "This picture was taken with a polaroid camera around 1960, when I was about 21 and Roy was around 24 years old, in the Gator Bowl football stadium. The stadium is now the Alltel Stadium, home of the Jacksonville Jaguars. He was doing a show that night with a big group of entertainers. 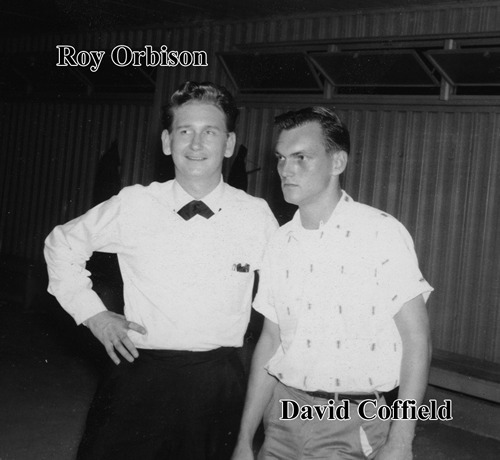 At that time I was playing in a local band and knew many of the promoters so I was able to get into the dressing room to meet Roy. A friend of mine snapped the picture right after Roy took his glasses off and held them behind my back for the picture. I have met several celebrities in my 66 years of existence but this picture is one of my most prized possessions. I thought this photo may be unusual because I don't recall seeing Roy without his glasses at this age. This picture is a "treasure" to me and I hope it can be preserved and enjoyed by others in the future. I put both our names on this photo. I also have this without our names. You, and/or any other interested party, have my permission to use this photo in any way that would promote Roy Orbison's image in a positive or favorable manner, without further permission from me."